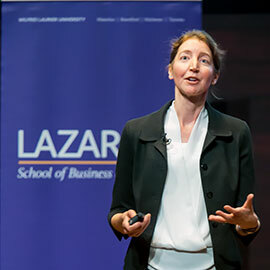 The Lazaridis School of Business & Economics and Laurier Centre for Economic Research & Policy Analysis hosted students, academics and community members on Nov. 17 for Economic Outlook 2017. Beata Caranci (MABE ’98), VP and chief economist at TD Bank Financial Group and a Lazaridis School alumna, was the event’s keynote speaker. Caranci’s topic – Is the glass half full or half empty? – explored the predicted state of Canada’s housing market, labour force and growth over the upcoming year. “Real estate in Canada has been both a blessing and a crutch,” said Caranci. Real estate has been a growth generator, contributing 30% to growth from Aug. 2015 – Aug. 2016. However, Canada’s household debt to after tax income ratio was 155% in Q2 of 2016, compared to 79% in Q2 of 1990. Later in the evening, David R. Johnson, Economics professor at the Lazaridis School, and Tony LaMantia, CEO of Waterloo Region Economic Development Corp., joined Caranci for a panel moderated by CTV News Reporter Allison Tanner. “The economic landscape is undergoing major change,” said Johnson. “I think the biggest challenge is around the uncertainty.” Due to the ratio of housing prices to rent costs or income, Johnson thinks there is a good reason to worry about housing. “You want to be able to sell the talent of a region,” said LaMantia, who spoke about how the Waterloo Region can position itself to compete globally with industries like technology. The challenge? “We just don’t know what new jobs are going to be created due to tech,” he said. “Reducing regulatory burdens and ease of doing business is really important,” said Caranci, who believes Canada hasn’t tapped into exporting our talent, businesses and services. She recommends more money and resources should be invested into developing and maintaining the country’s own intellectual property. Economic Outlook is hosted in November each year by the Lazaridis School of Business & Economics and Laurier Centre for Economic Research & Policy Analysis.